Every year, dozens of volunteers transform Rancho Los Cerritos’ historic house and gardens for the holidays. Each room tells a story about the traditions of people who live in California in the 19th century. The Foreman’s Room – This room is set to look as though a father, employed at the Rancho, has turned his bedroom into a space to prepare for celebrating the holidays. 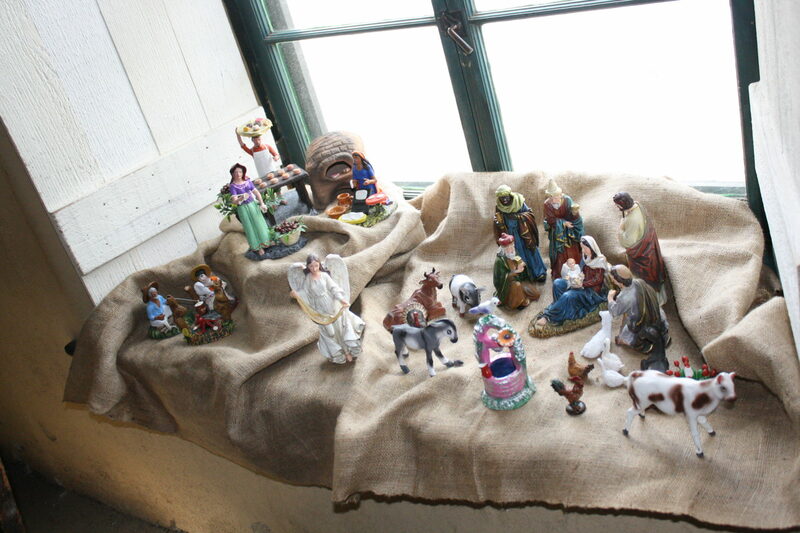 On the windowsill, there is a nacimiento (manger scene infused with Mexican traditions include a rooster to herald the birth of Christ). There’s also papel picado (cut paper) strung along the wall, a traditional and very colorful holiday decoration. On the bed is a piñata in the midst of being decorated. The seven points of the piñata symbolize the seven deadly sins. When struck and broken, the seven-pointed piñata symbolizes how Christ’s birth defeated these sins. Laundry Room – The laundry room features Victorian-era finery, illustrating how women of the era enjoyed creating and dressing in the latest fashions. Guests are able to see two dresses on display. Food Storeroom – The food storeroom illustrates the goodwill that went into preparing charity baskets at Christmas time. Charity baskets generally included special holiday foods such as baked goods and preserves, as well as staple foods like flour and coffee. Staple foods were always needed and welcomed, whereas gifts of special holiday foods reflected the givers’ wish that family ties–and social traditions–be maintained within their community. The boxes also include wrapped gifts to symbolize Christmas being brought to families in need in a different way. Outside the food storeroom, a banner hangs with a Charles Dickens quote, as his A Christmas Carol (1843) is widely credited with helping transform Christmas into a time to help the poor. A German Christmas tree. This artifact is circa 1880. Blacksmith Shop – Victorians often made their own ornaments and gifts, as they were not accustomed to buying gifts from the store. In the workshop, this is demonstrated by the carpenter/blacksmith making wooden toys and a small German Christmas tree. The German Christmas tree in-progress here is a period-appropriate wooden Christmas tree that has white round platforms, a central square pole, and candles. Sunporch and Library – Festively adorned with Christmas banners and fragrant garlands, the sunporch and library exemplify the variety of Christmas decorations Victorians used in their homes. The tree in the library is decorated with strings of popcorn, cornucopias, sachets filled with potpourri, shell ornaments, and an assortment of brightly colored baubles–all of which are traditional Victorian-inspired decorations. Both homemade and store-bought, these ornaments serve as an “outward sign of the inward spirit of Christmas.” On the mantle is a lovely Victorian-inspired display of color and texture, including seasonal greenery and gilded pinecones. Literary Salad, a popular parlor game. Parlor – The Parlor highlights the fun of Christmas entertainment: games, music, and literature. On the parlor table, there is the game called “literary salad” and a music book to accompany the fiddle showing that Victorians enjoyed singing carols. Uncle John Bixby played “Turkey in the Straw” at Christmas celebrations, among other favorites like “Never Bank on a Traveling Man” and “Red Wings.” There is a beaded slipper on the floor, used in the game “Hunt the Slipper” which is similar to hot potato. The decorations also feature fragrant seasonal greenery and ivy, fruit in bowls and as decoration, even a kissing ball suspended from the ceiling–all Victorian-inspired holiday décor. Dining Room – The dining room encapsulates the importance of the Christmas feast. The table is set with the finest linens and china with seasonal table decorations. The feast will include roast goose, potatoes, and a vegetable. The table near the alcove is set with appropriate desserts like plum pudding, pies, and cookies. Each setting is placed on a crimson placemat that has been beautifully embellished with buttons. 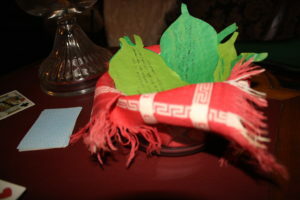 On each place setting is a Christmas cracker, inside of which is a paper hat, a fortune, a small toy, and a tiny balloon. 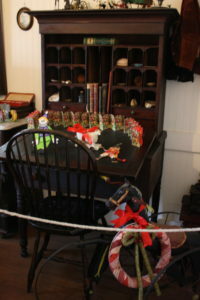 The desk in the children’s room decorated with toys. Child’s Bedroom – The upstairs hallway and child’s bedroom focus attention on Santa Claus, stockings, and Victorian-era toys. There are mounted Thomas Nast Christmas cartoons of Santa Claus from Harper’s Weekly. Nast’s cartoons of Santa from the 1860s to the early 1880s, along with Clement Moore’s 1823 poem “A Visit from St. Nicholas” (now known as “The Night Before Christmas”) transformed the image of Santa to what it is today. Displayed on the what-not cabinet are some 19th century greeting cards featuring Santa Claus. The child’s bedroom is furnished with children’s’ toys from the collection as well as some reproduction toys. Stockings are hung from the bedpost. Master bedroom – Focusing on the type of gifts Victorian adults gave to one another, this room looks as though the wrapping of gifts is underway. Examples for women might include jewelry, doilies, candle sticks, tea strainers, silver frames, leather gloves, pomander balls, and fans; for men, perhaps some cigars, scarves, mufflers, a watch case, and collars; for workers, maybe some fruit, candy, books, combs, and handkerchiefs. Wrapping materials include tissue paper and colored ribbon. In lieu of tape, Victorians used an egg white mixture for paste. 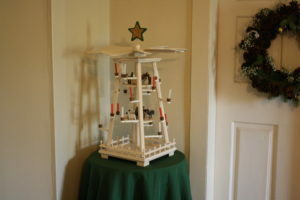 In the corner of the room, there is a 4’ Christmas tree on a table, accompanied by a bucket and a sponge on a stick to put out any fires, since the tree was decorated with lit candles.